Stefano Signorin was born in the Veneto region of North Italy in 1967. After a traditional education he decided to move to Florence to pursue his passion for painting which he had always had, as a self-taught artist. In Florence he met his teacher, Fiorenza de Angelis; after two years of study in her Atelier in Piazza S. Croce, he became her assistant. He improved his knowledge of the Science of the Spirit (Anthroposophy) and while still very young began to teach all over Italy,while at the same time continuing to learn more about painting; he also studied painting therapy. He took part in the founding of the Waldorf School in the role of treasurer, and in the birth of the “ Luca’School “ for training in painting therapy, and taught there for several years. At present he lives and works in Padua, near Venice. 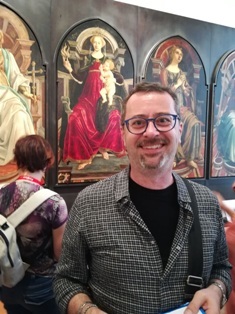 After seven years’ teaching at the Waldorf school, he left to dedicate himself to painting, studying and teaching; he holds courses in various Italian towns.